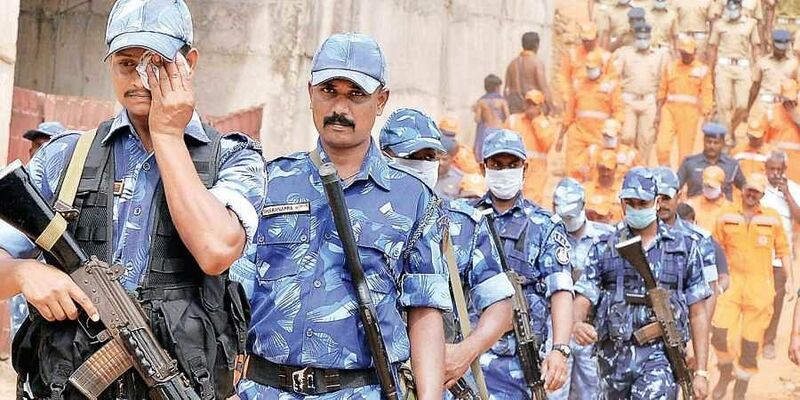 Security measures were further tightened at Lord Ayyappa temple for three days from Tuesday in connection with the anniversary of Babri Masjid demolition. SABARIMALA: Security measures were further tightened at Lord Ayyappa temple for three days from Tuesday in connection with the anniversary of Babri Masjid demolition. As part of tightening security, a joint parade of Central paramilitary force, including Rapid Action Force and National Disaster Response Force and commando force of Kerala police was taken out in the morning. Special task personnel, bomb squad, mufti police and intelligence wing of police in adequate numbers were deployed to keep vigil to prevent any untoward incident, IG of police Dinendra Kashyap said. Instructions were given to security personnel to be pilgrim-friendly and the tightened security should not lead to any inconvenience to the pilgrims, the IG said. Adequate number of security personnel was deployed at important locations to keep watch on the movement of pilgrims and others, Kashyap said. Restrictions were imposed on the pilgrims for darsan at the enclosure in front of the Sreekovil on Wednesday. Pilgrims will be allowed darsan only through the queues in front of the Sreekovil and the special queue will not be allowed on Wednesday as part of the security restrictions.